Los Angeles' Top 25 Restaurants list is back this month with a number of shake-ups to the list. Veteran restaurants AOC and Spago made a clean swap with the former grabbing the No. 1 spot and the latter falling to No. 3. Also joining them in the Top 5 are Alma, which continues its climb up the list at No. 3, as well as Mastro's Steakhouse (No. 4) and Bucato (No. 5), which both made impressive jumps up from their previous standings to clock in at No. 19 and No. 16, respectively. Additionally, Republique finally returned to the list from its over one year absence, ranking at an impressive No. 14. AOC's Polenta and Vegetables | Yelp. Jam Y.
Republique's Croque Madam | Yelp, Jam Y. Alma's Uni and Tofu | Yelp, Liz O.
Spago's Dessert Tray | Yelp Kent D.
The Los Angeles Top 25 Restaurants list returns this month, featuring all Top 25 veterans. Wolfgang Puck’s Spago maintains its No. 1 spot for another month in a row, followed closely by Animal and AOC at No. 2 and No. 3, respectively. Michael Voltaggio’s Ink made an impressive jump from No. 25 to No. 4, with Downtown LA darling Alma also rising from No. 23 to No. 5, though the latter’s jump may be related to rumors of an eventual shutter. Despite losing Chef Evan Funke earlier this year, Culver City favorite Bucato still ranks on the Top 25, coming in at No. 16. The list also welcomes back Father’s Office, which hasn’t ranked since back in December of 2014. Alma's Smoked Ocean Trout | Yelp, Jennifer B. Ink's Mountain Yams | Yelp, Dean C.
Spago's Bacon Macarons | Yelp, Ivy W.
It’s great to see you again, Los Angeles! Since our last Foodable Top 25, there have been tons of new restaurant and bar openings in the area, making for an interesting list this month. April data shows that AOC falls off the throne and down to No. 8. Bäco Mercat and Sqirl, which held the No. 2 and No. 3 spots last time, also make their way down the list, to No. 6 and No. 12, respectively. So, who took it to the top this month? With an impressive climb up from No. 17, Spago hasn’t even made it into the Top 10 since October 2014. And this is the first time the restaurant has been ranked No. 1 on LA’s Foodable Top 25. Steered by the legendary Wolfgang Puck, Spago takes California cuisine to the next level in a fine dine setting using a farm-to-table philosophy with a simple design aesthetic to complement the guest experience. Spago is co-owned by Barbara Lazaroff, and Lee Hefter is Executive Chef and Managing Partner. Also on the list this month, we are excited to welcome some Foodable Top 25 first timers, three of which broke into the Top 10! Welcome Butchers & Barbers, Stir Market, Status Kuo, and Gjusta! Check out the full Top 25 rankings below. Duck breast, figs & chanterelles from Spago | Credit: Yelp, Anthony N.
Tangier quinoa bowl with salmon from Stir Market | Yelp, Anna D.
Bacon & Eggs ravioli from Maude | Yelp, Jennifer B. We see some major shifts in this month's Los Angeles Top 25 ranking before the close of 2014. At No. 1 restaurant this December is AOC with a social score of 178.37. This upscale eatery is known for its small plates and wine selection and moves up from No. 5 to replace November's victor, Maude. Jumping from No. 7 to No. 2 is the European restaurant known for its Spanish-fusion fare, Baco Mercat. Sqirl drops one rank but stays strong to round out the top three. Foodable welcomes back a few restaurants that took a brief hiatus from the list- including the restaurant, Father's Office that lands at No. 14 and Hinoki & the Bird at No. 22. Hanging on at No. 23 is the neighborhood bakery and pizzeria, Milo and Olive. Driver Scallops at AOC | YELP, Carol L.
Pulled Goose Confit at Bäco Mercat | YELP, Ed K.
Brown rice bowl with sorrel pesto, preserved meyer lemon, pickled radish, feta, and a poached egg at Sqirl | YELP, Rose C.
Warm butter Cake at Mastro's Steakhouse | YELP, FIFI L.
Which LA restaurants have the highest social scores this November? This month's list features 23 returning restaurants and two newbies. At no. 1 is Maude with the high social score of 178.73. The victor moved up from no. 8 last month and is an eatery with a tasting menu that changes seasonally. Right behind at no. 2 is Sqirl and Mastro's Steakhouse moves up from no. 13 to round out the top three. Foodable welcomes Bowery Bungalow, a farm-to-table concept featuring Middle Eastern Flavors at no. 8. The casual vegan eatery and wine bar, known as The Springs makes it debut on the list at no. 20. 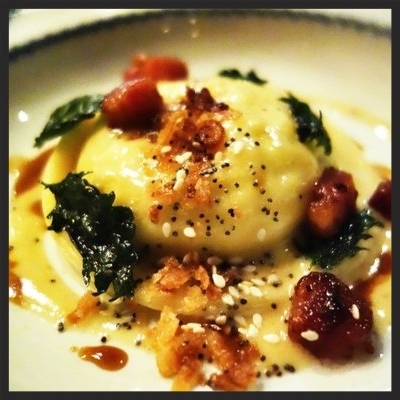 Ravioli with duck egg, artichoke ricotta, nueske bacon, and onion jus at Maude | YELP, Jennifer B. Pork Belly at Sqirl | YELP, m h.
Fresh berries at Mastro's Steakhouse | Yelp, fifi l.
Rib-eye over peanut butter at Trois Mec | YELP, Sean L.